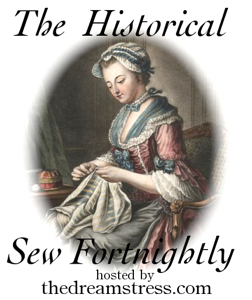 When the 10th HSF challenge – Art, was announced I didn’t need to think for long. I emetetly knew I wanted to make the Rose Adélaïde Ducreuxs dress fom her “self portraite whit a harp”. 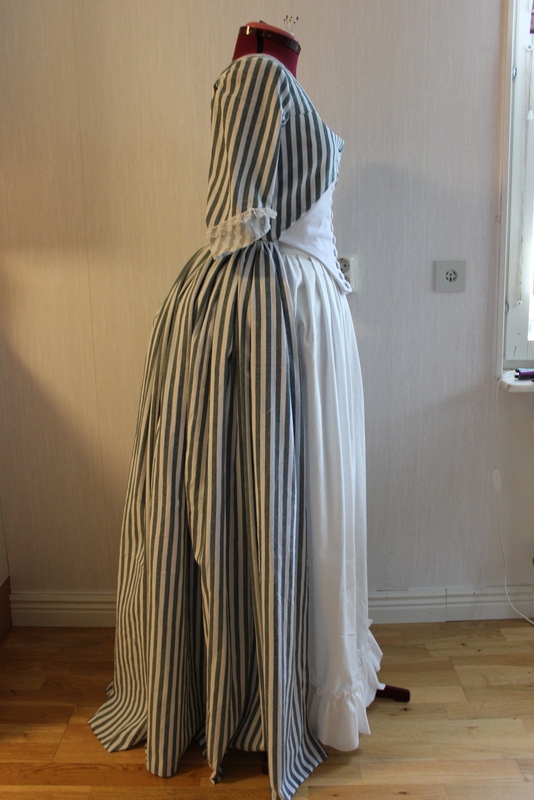 I even took the opurtunity to make the skirt and fichu from the portrait for a previous challenge, to be able to only focus on the dress for this one. 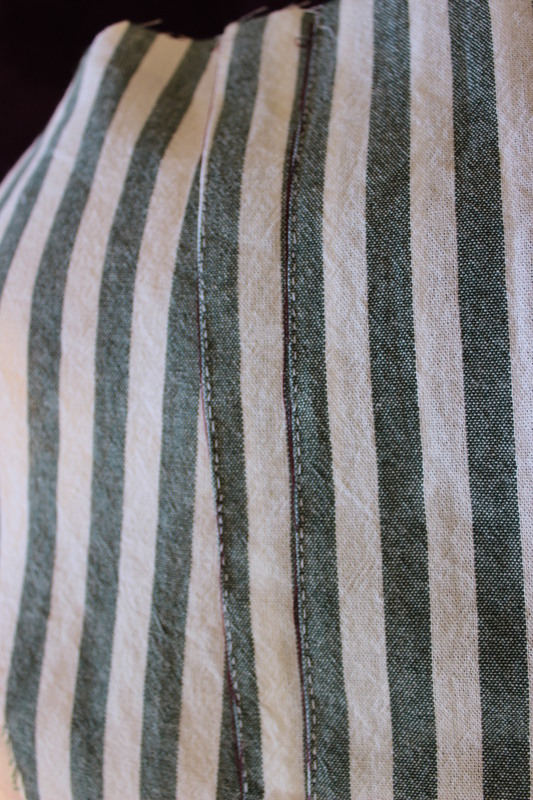 I alreay had the fabric 8m of striped cotton, bought on sale about a year ago. 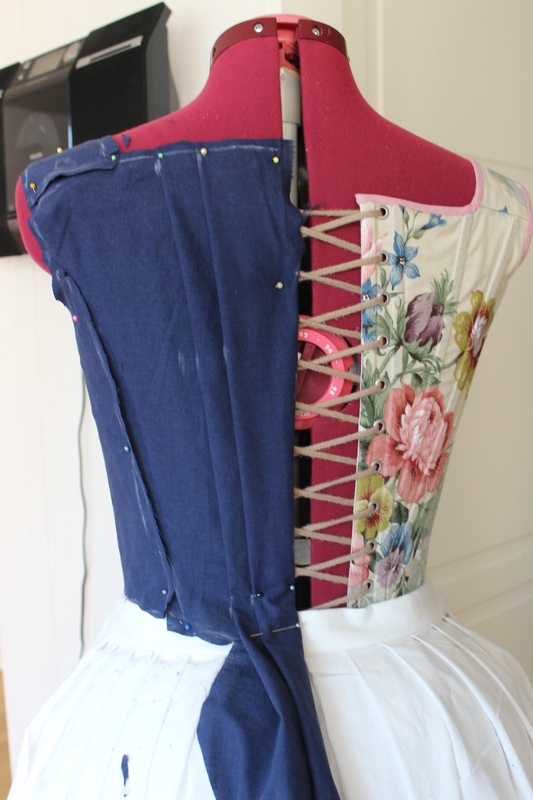 I put my corset, bumpad, and petticoat on the dressform and started to drape the bodice pattern. 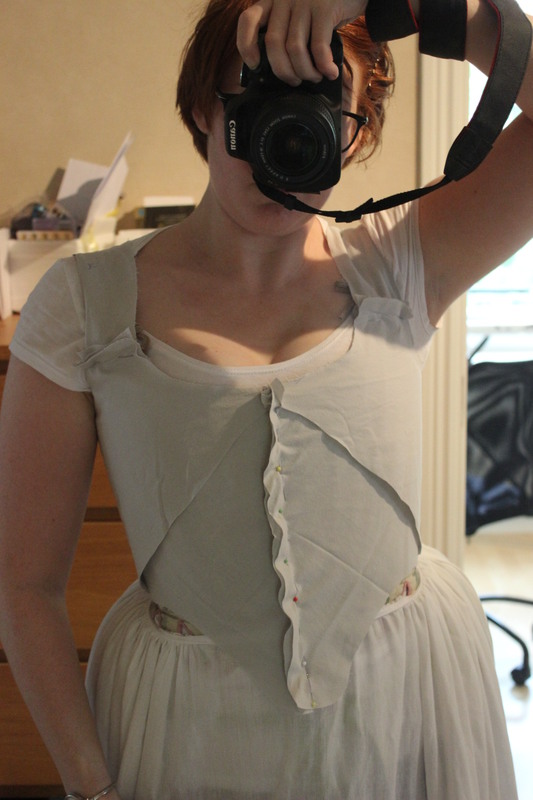 Then I cut the toile, sewed it togeter and tried it on. 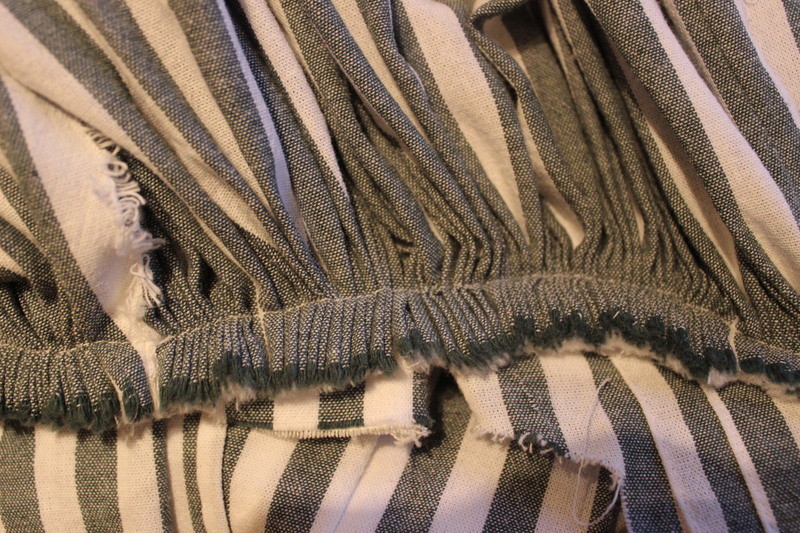 Then it was time to cut the fabric. 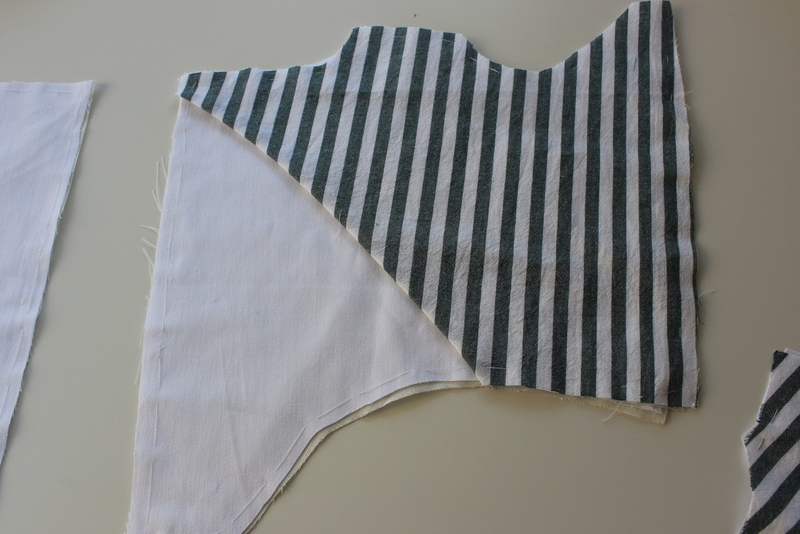 Besides from the striped cotton, I used a bleached linnen fabric for the zone front and a white cotton twill for interlining. 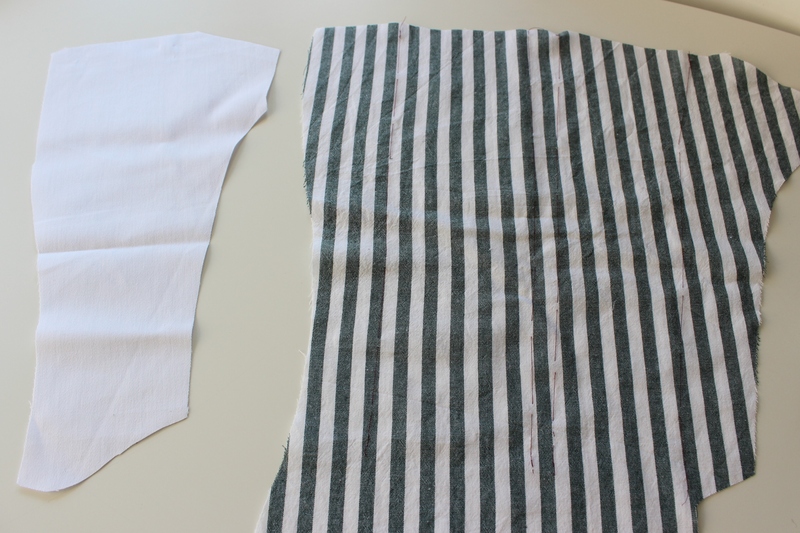 I started the sewing by basting togeter all the different layers – so yes, I did do some handsewing. 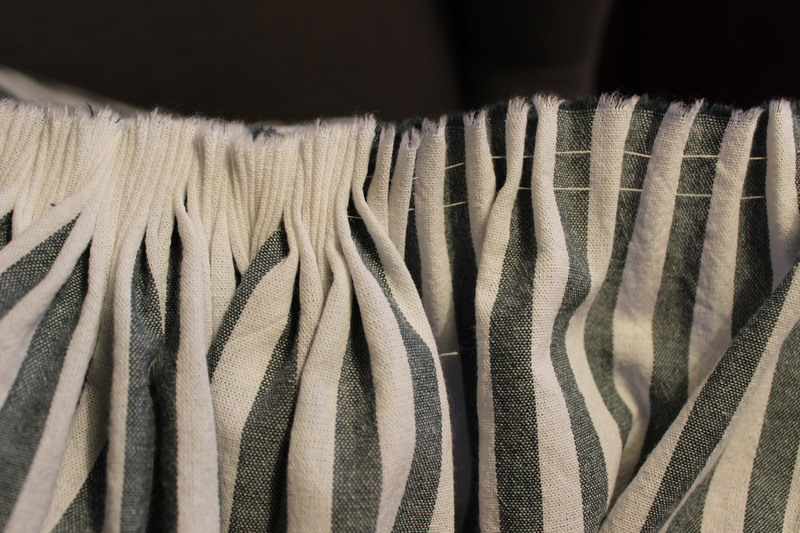 Then I shaped and stiched the back pleats in place, usin tiny backstitches. back piece and back lining. 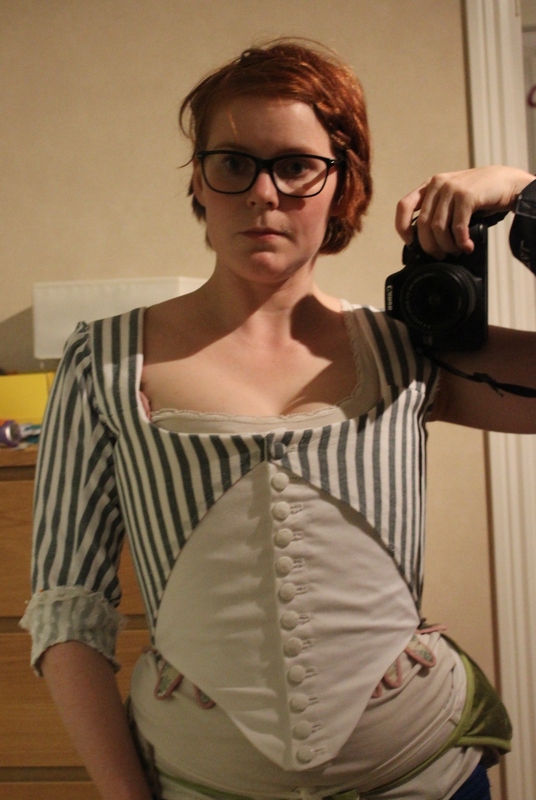 I then sewed the bodice togeter and tried it on to check the front closeur. And as you can se the front lines dont match up. 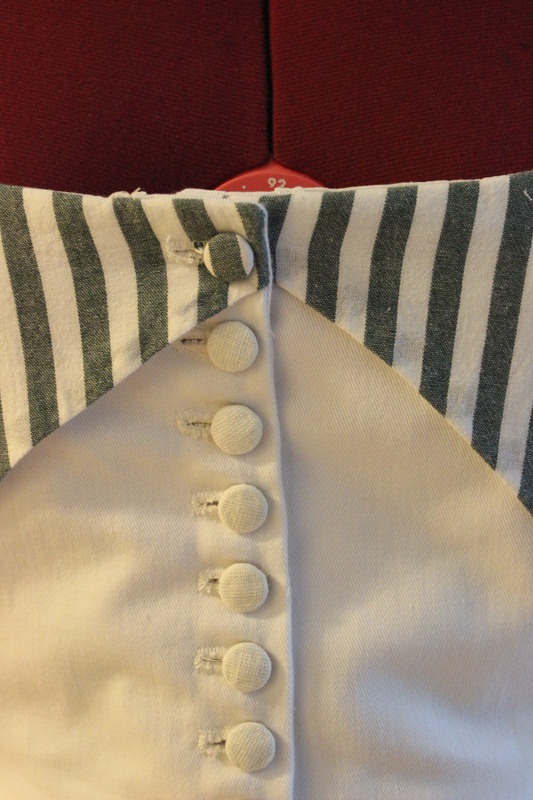 So to fix that I needed to adjust the center front line and make a buttonhole placket. 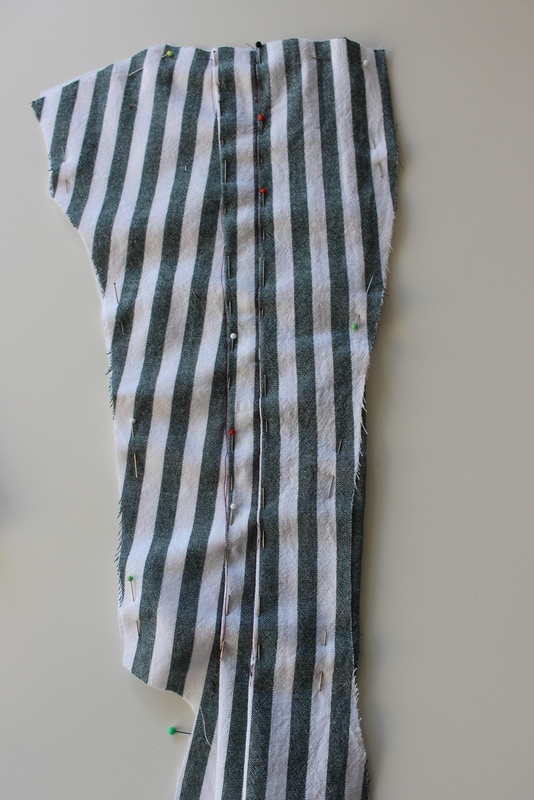 This metod is usaly a big no no in sewing but time was sparse and I’ve already manadged to mach the stripes pretty good, so I did’nt want to adjust the side seams. 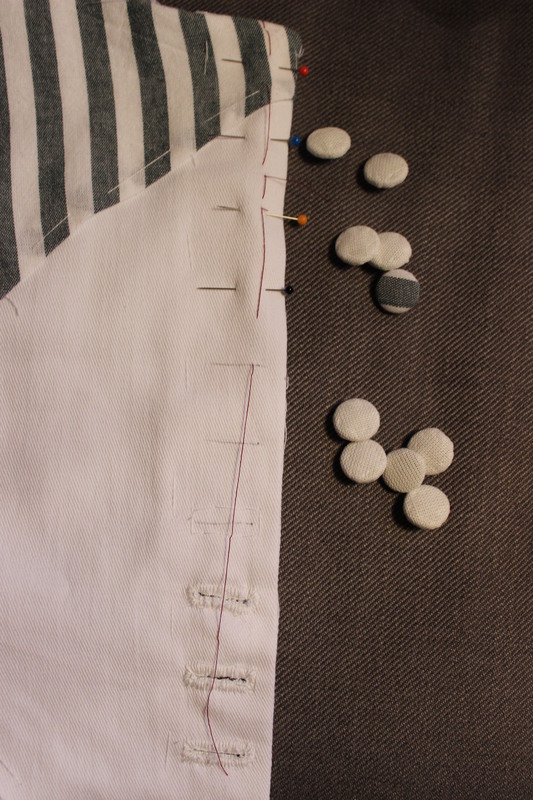 Then I started on the button and buttonholes, also hand stitched. They are not as neat and pretty as I would have liked but they will have to do. 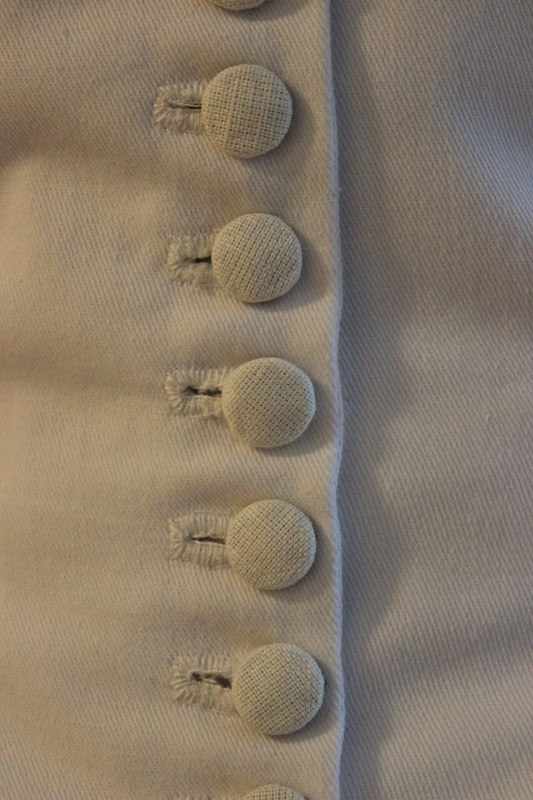 And I even needed to use some fabric glue on the buttons to keep them from snapping apart. It was about here I noticed that something was of with the front piece interfacing. 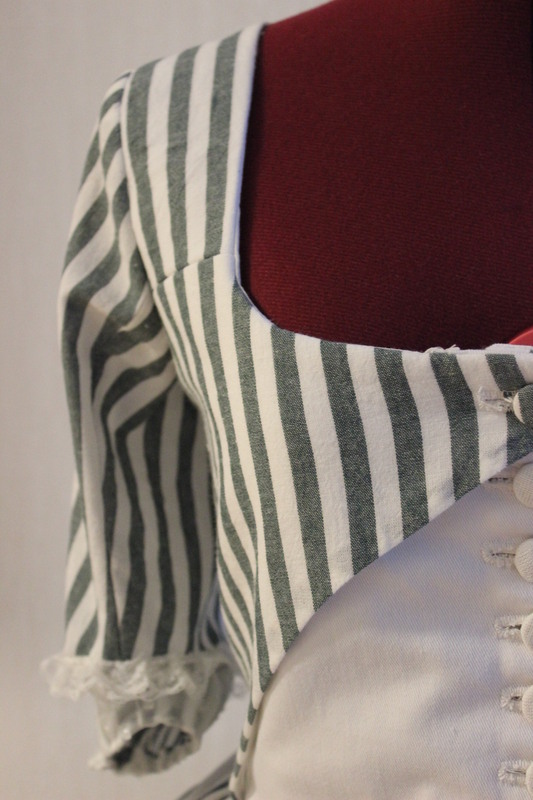 While basting the layers togeter I’ve manadged to put the interling as outer fabric, then stich the hole bodice up like that and on top of that make the buttonholes. Darn it. 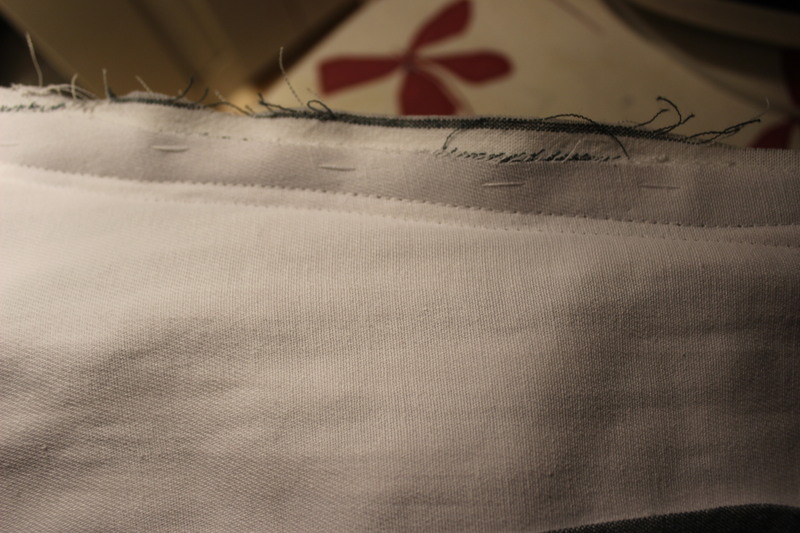 So I continued by cuting and setting the lining, using a regular white cotton fabric. 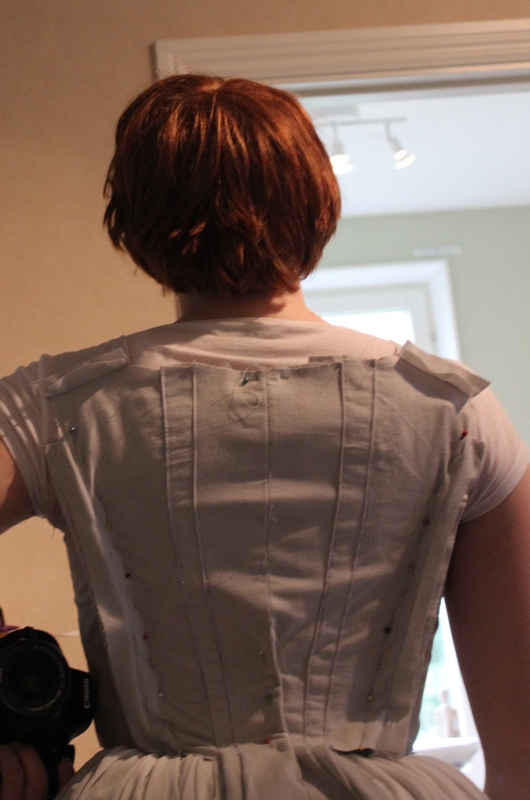 Before the next try on I pinned the sleeves on losely to get a grip on their placement. 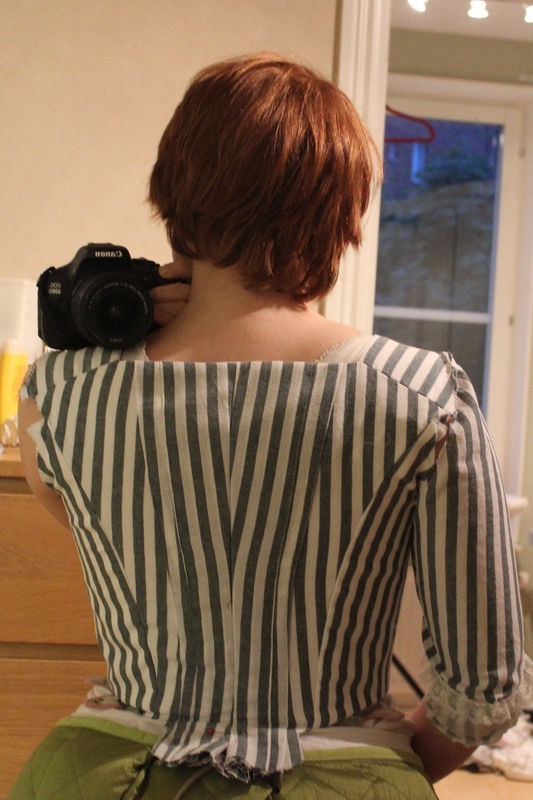 Unfortanly the sleeves were the last things I noticed when I put it on – The stupid bodice was way to smal. 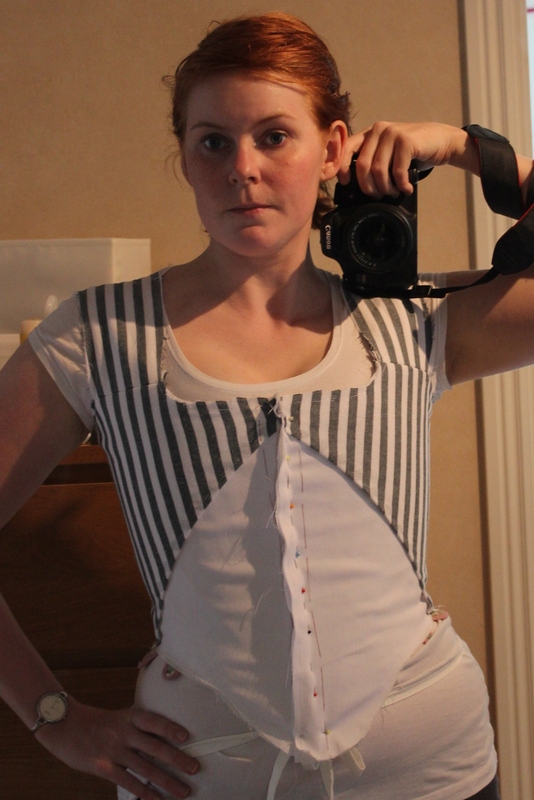 I tightened my corset all I could, and did manadged to close all the buttons. 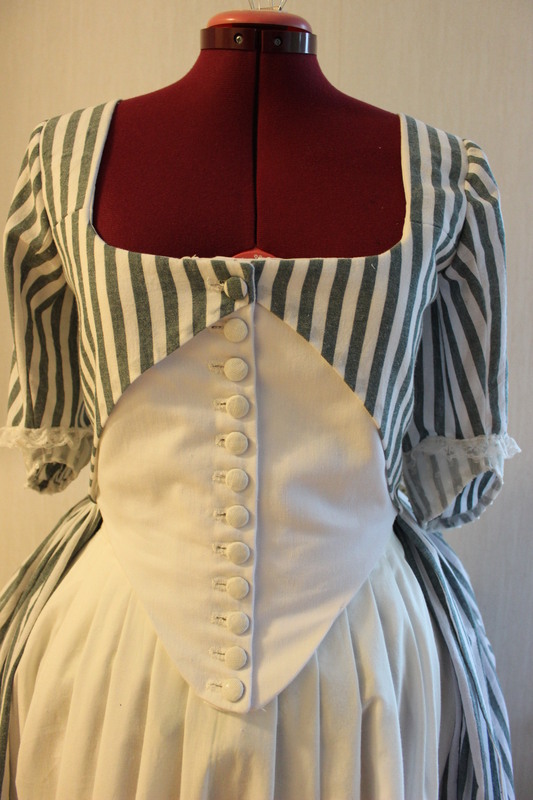 Only now the bodice looked horrible and the stresslines were pulling all over the front. 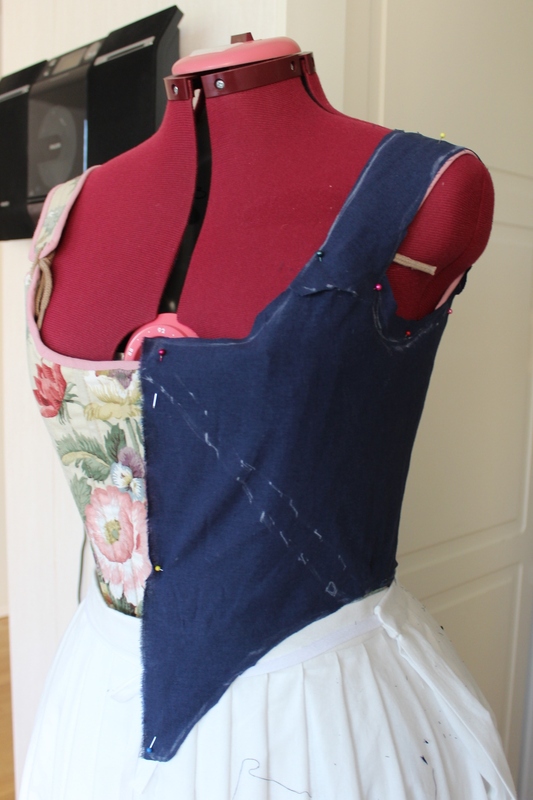 So back to the sewing machine I whent, using the alowence in the side/back seams to make the bodice a total of 2,5 cm bigger. 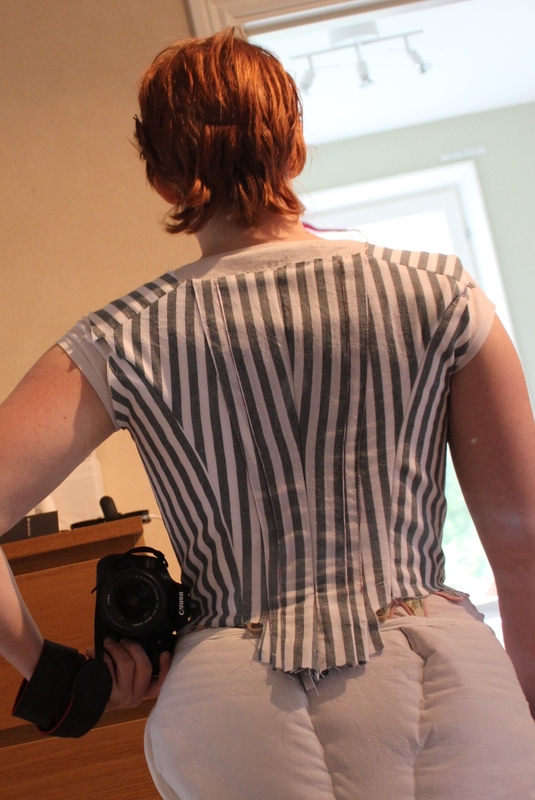 Then I pinned and sewed the sleeves. 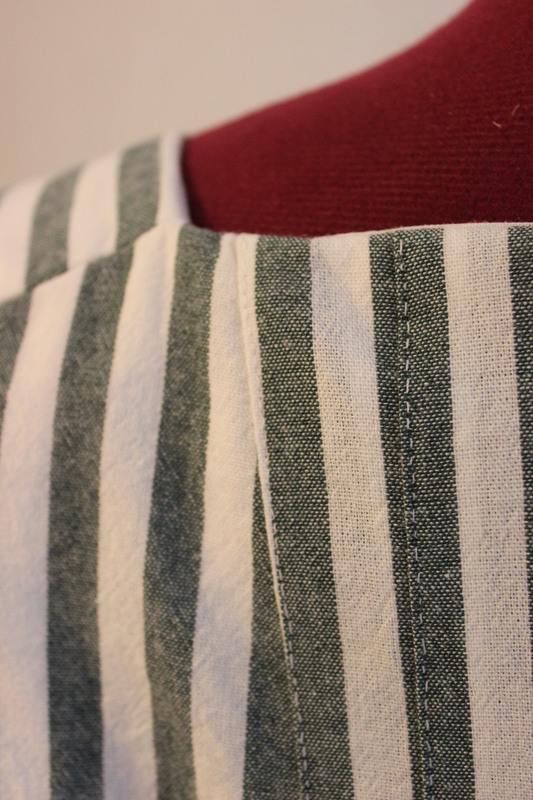 The insertion was an easy one, but the deciding on the sleeve trim was a bit harder. In the end I decided to stepp away from the inspiration and go with my guts and use a smaler design then originaly planed. Now it was time for the skirt. 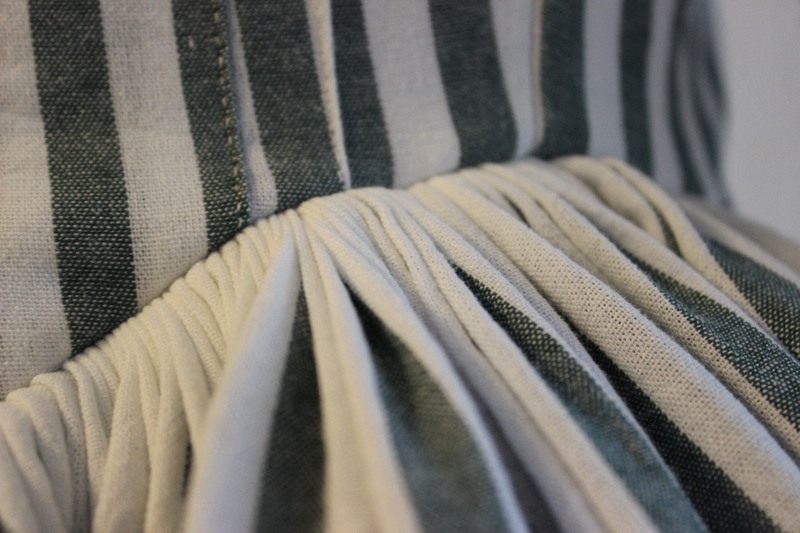 I sewed the pannels together and hand stiched lines of gatering thread, to get them nice and even al over the skirt. 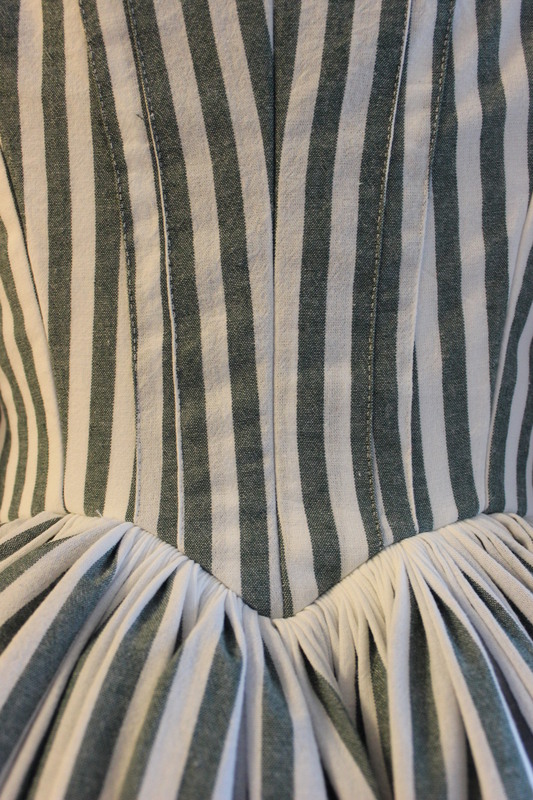 Then I pulled the skirt waist togeter and pinned it to the bodice, using the zone front as a mark were to start the skirt. 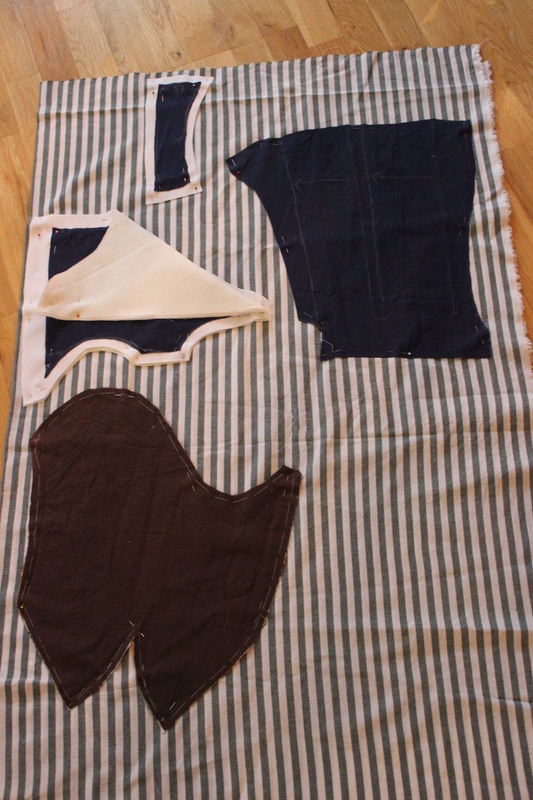 The sewing was abit tricky, geting all the fabric to lay smothly. The final touches was to finish of the arm hole, tuck down the lining and stich on some Busteling-ties to make it an “Polainese”. 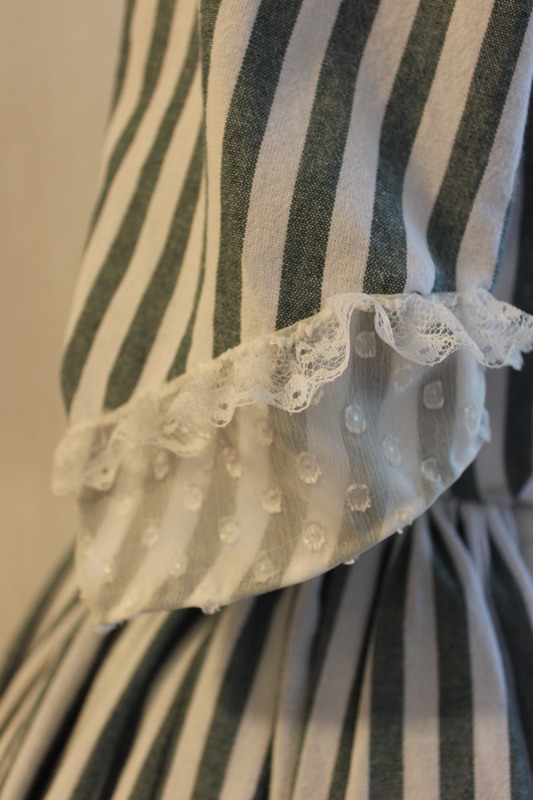 What: a 1780s robe Anglaise. 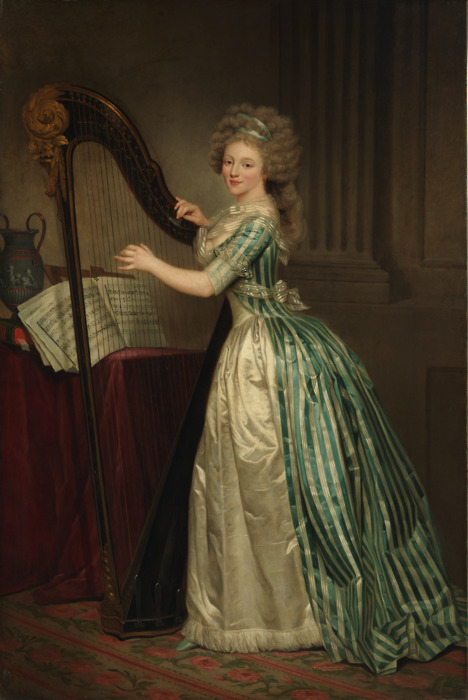 Inspiration: Rose Adélaïde Ducreux “self portarit with a harp”. 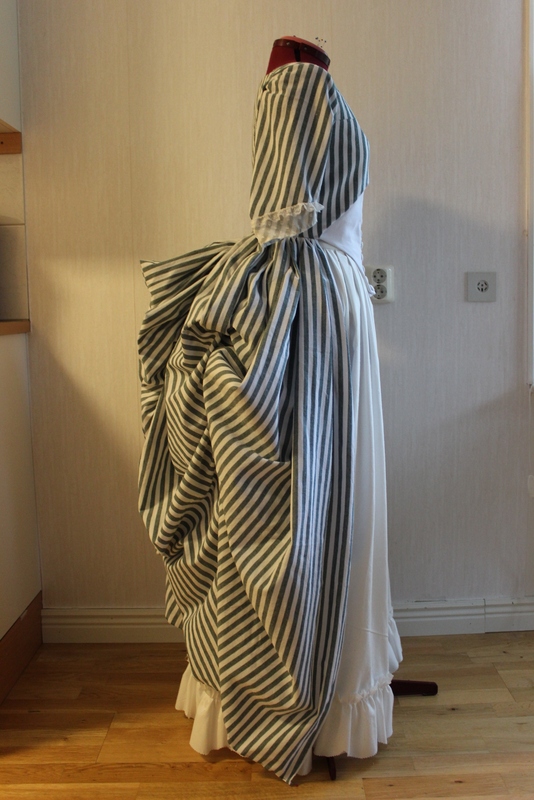 Pattern: I draped my own, using Arnolds “Pattern of Fashion” as a guide. 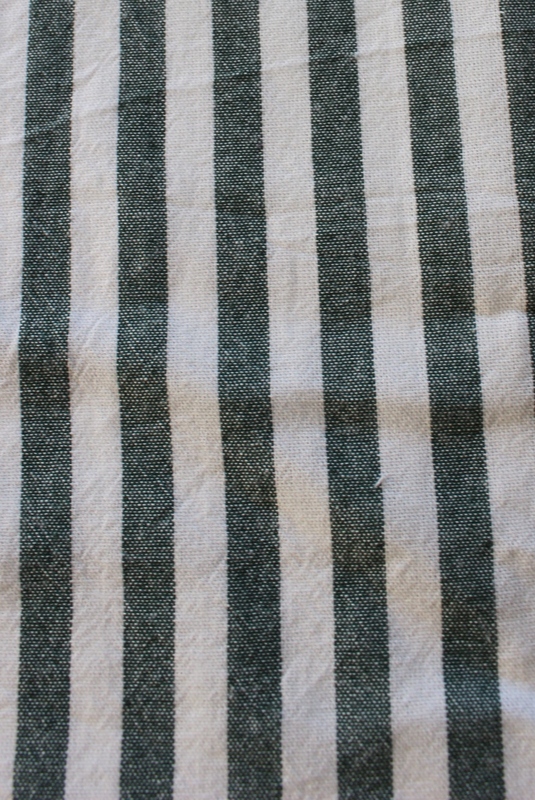 Fabric: 4 m of striped white/green cotton, 0,5 m of white linnen, 0,5 m of white twill for interlining, 0,5 m of white cotton sheet for lining and 0,3 m of white dotted organdy for sleeve cuffs. 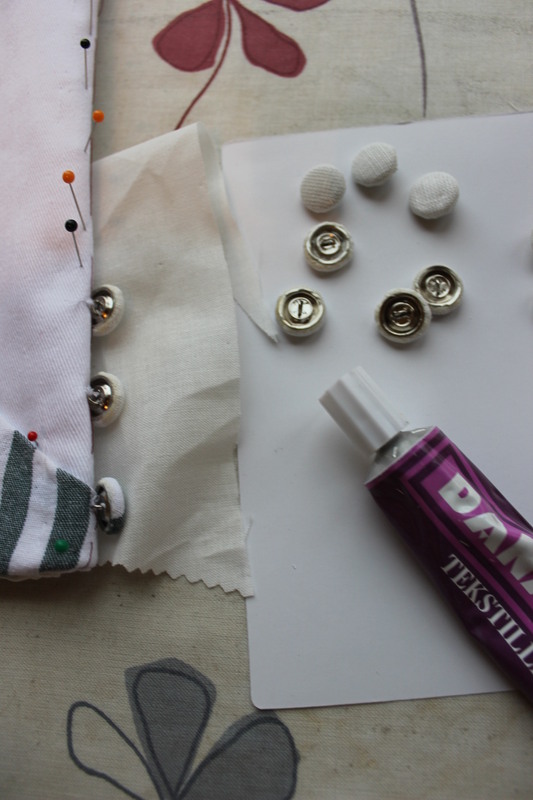 Notions: Thread, 10 self covered buttons, 1 m plastic boning, 5 cm cottin string. 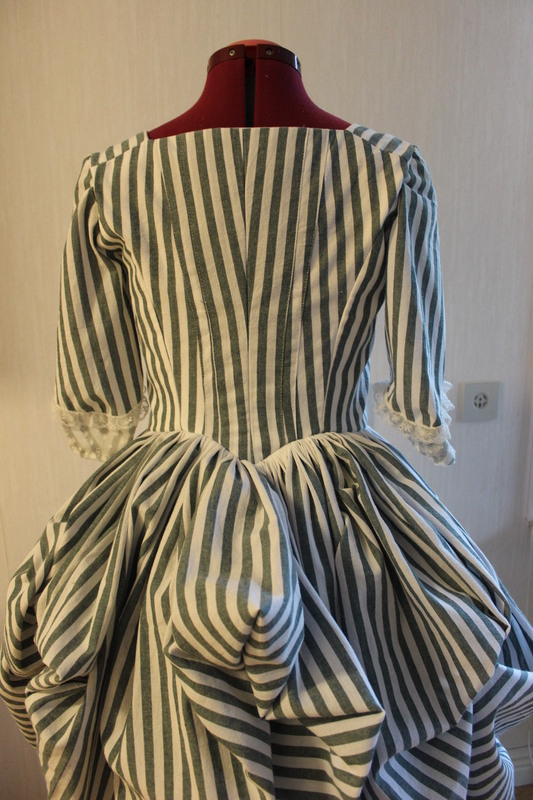 How historical accurate: The shape and look of the garment are ok, but it is compleatly machine made with modern tecniques. I dind’t had the time or the money for a compleatly hand made silk dress. Time: On and of for two weeks – maybe 15-20 hours. 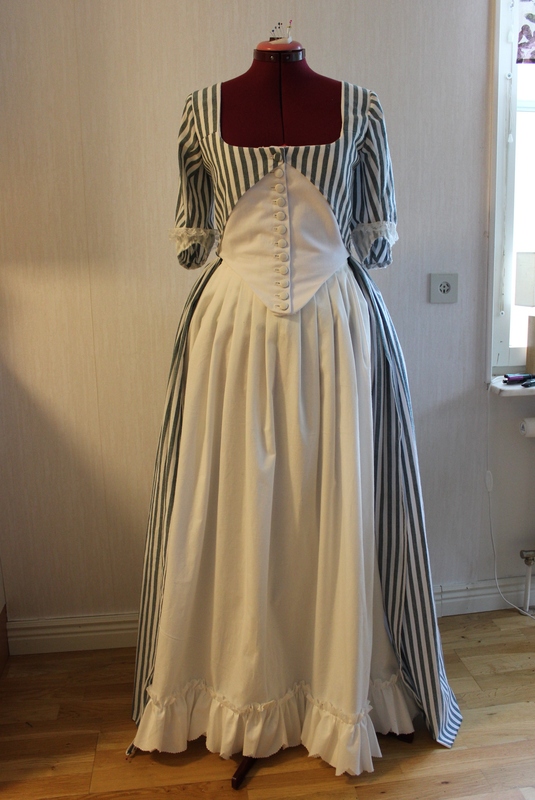 Cost: about 300 Sek (48Usd). All fabrics were stash and bought on sale. 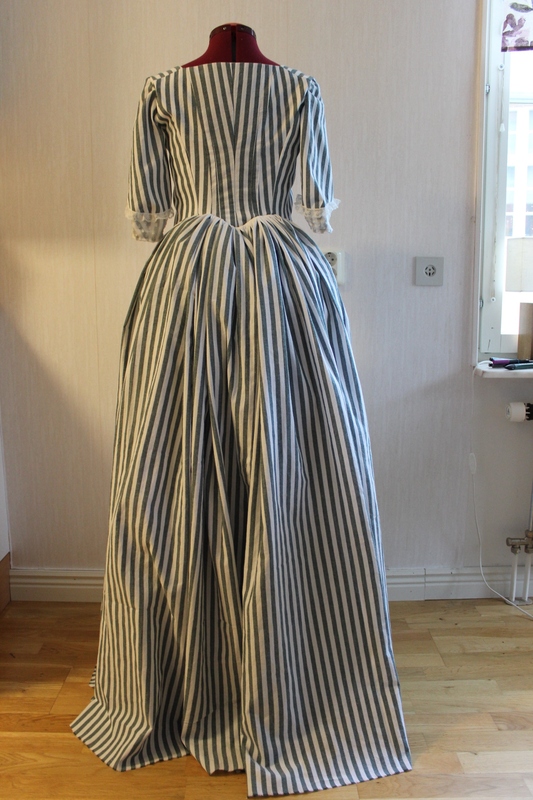 First worn: Not yet, but will be (pared with the White entries) next weekend for the huge historical picknick i the capital. Final thoughts: The dress are not an exact copie of the one in the portrait, but I do think it looks pretty good. 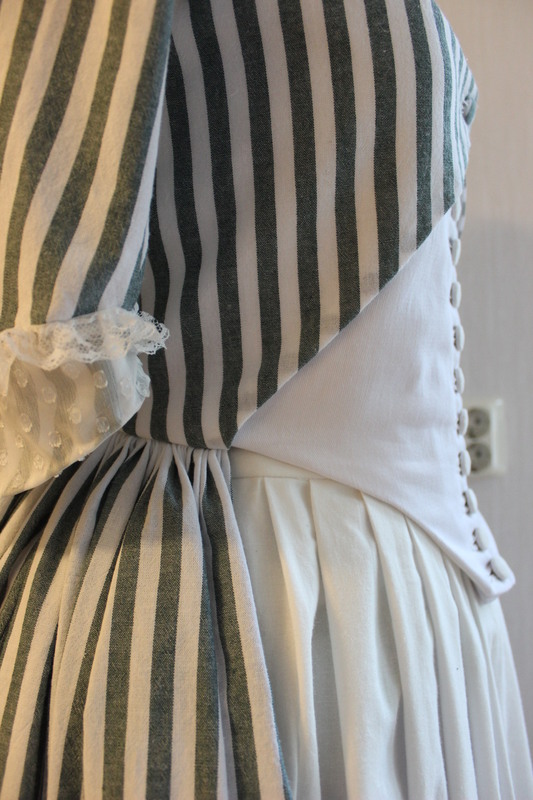 I’m a bit anoyed about the stress wrinkels on the front bodice, but with the time constriant am glad I manadged to finish it of at all. Tomorrow I will give it a real try out and se if it passes the test. This came out lovely. The cotton holds up very well for the style. 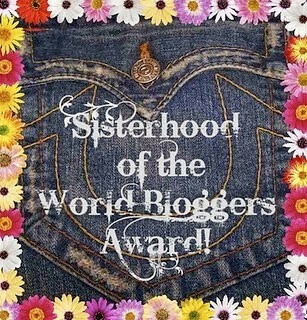 Congratulations and thank you for the inspiring photos. Thank you! 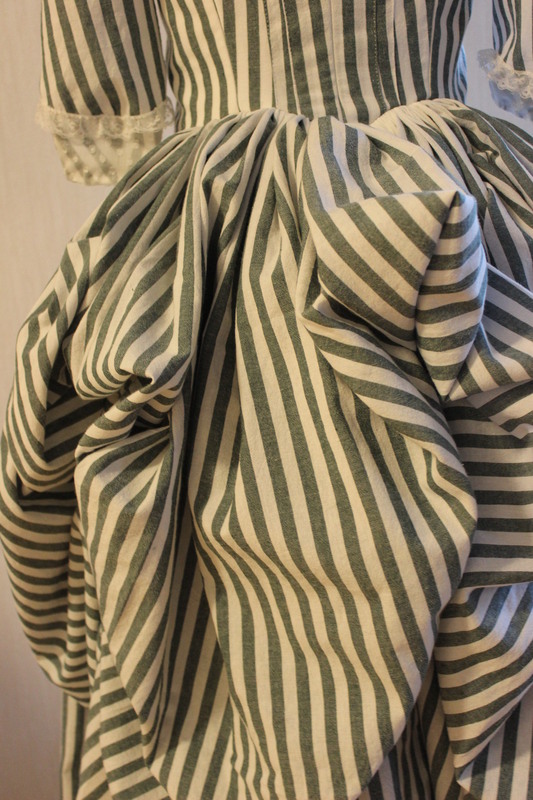 Yes, I think the fabric was perfect, even though it wasn’t silk like the inspiration. Your dress is pretty, it came out really well. Thank you for sharing. So beautiful!!! Thank you for sharing your process. Great job! And your buttonholes look pretty neat to me. Yeah they do look Ok,(guess I can be a bit of a perfectionist sometimes). I belive in showing the process (both good and bad) if you whant other people to know and care about your work. Love this painting and love this dress! 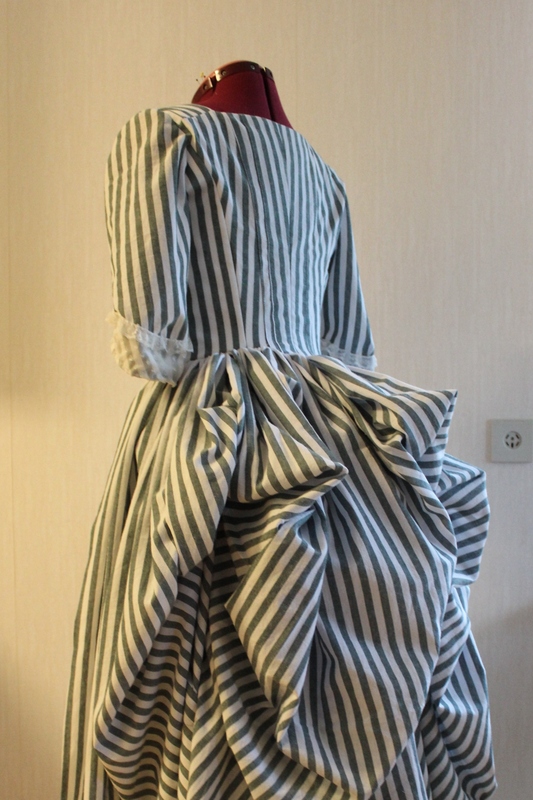 I’m thinking about making a striped petticoat to match the yellow jacket I made last week, and this encourages me even more! Thank you! Yes the painting is one of my favourites. 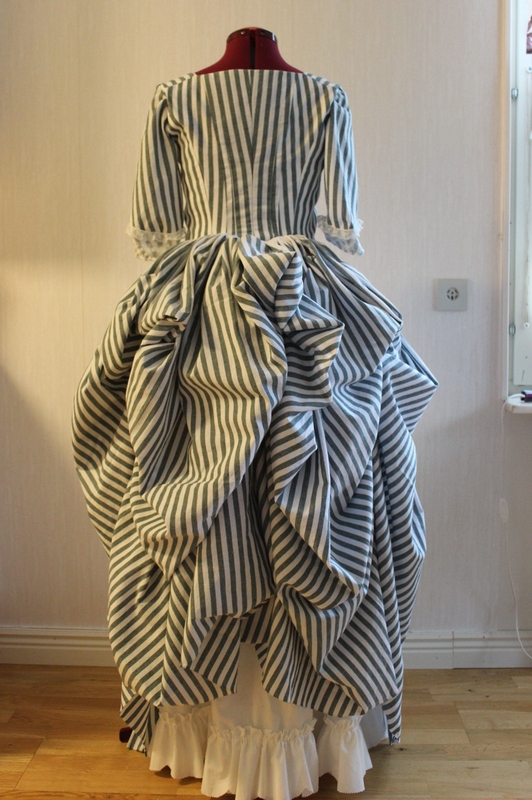 This is the second time I’ve come across your blog and I am in love with your dress. Thank you for sharing the process and it’s inspirational to me to make one. The drafting is a little daunting as I have no one to help me draft on my person so I’ll use my dress form and go from there. Thank you again for showing your work!